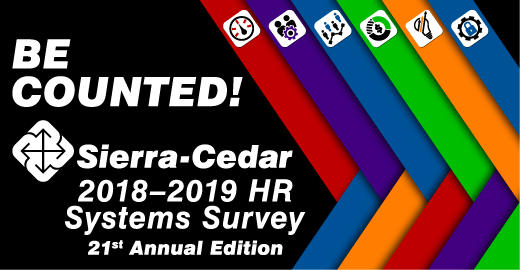 It’s that time of the year — the 21st annual Sierra-Cedar HR Systems Survey is upon us. This is probably the most comprehensive survey for HR users, covering virtually all aspects of HR technology use, from the traditional integrated HR/ERP systems to the latest emerging technologies and innovations. As a vendor, this survey helps LBi design and build high-value and in-demand HR solutions. We hear your voice, so your participation helps to ensure your current and future business needs will be met by software developers like LBi. And frankly, the survey tells vendors who is investing in new systems and where they are spending. This information heats up competition for your business, which means your organization will be presented with more options, ultimately (hopefully) leading to the best vendor choice. The survey takes about 20 minutes to complete, but in return you will be presented with a wealth of valuable and actionable information to grow and improve your HR operation, while helping vendors like LBi provide the finest technology solutions that you expect. We are looking forward to your response. The survey is now available at www.Sierra-Cedar.com/hrssv45 until the deadline on June 8, 2018. All participants will receive a copy of the complete results and all responses are confidential and only used in aggregate results.